Major U.S. stock market indices continue to confound perma bear rhetoric that has seen virtually every minor correction of the past 5 YEARS as the start of a bear market or worse an always imminent crash that has succeeded in scaring most retail investors out of bull market for its duration. When the reality is that if a crash has been taking place than it has been to the UPSIDE as illustrated by the Dow in the face of this time the "'Top is In' mantra resolving to close up another 112 points at 16,695 marking its 3rd closing new all time high of the year whilst the S&P added 18.17 to close at a new high of 1896.65. Most market commentators can only fumble and mumble to explain why as they throw unactionable guesses into the air such as hedge fund buying, or bargain hunting, or short covering, or earnings surprises (when there were no surprises) you know the usual garbage thrown up into the air to hope something catches readers interest. The bottom line is that most analysts are nothing more than salesmen, their primary objective is to entice you to buy a product or service, and therefore they have to follow the scenario's that are likely to generate the most revenue which is why the sales pitch is Crash this that or the other because FEAR SELLS ! Which is why politicians, intelligence agencies and market salesmen constantly play the fear card as I have written about several times over the years. Whilst the delusional perma bears can only continue with their slave like mantra that the top is in and everyone should go short each time the Dow retreats a few points from its latest rally high as I have repeatedly warned to IGNORE as they are literally setting themselves and anyone who listens to them to be crucified! So no black box top secret program, no need to subscribe to a flip flopping newsletter commentary service that is most bearish at market bottoms and most bullish just before markets top out and then suffers amnesia as to what was actually written which ultimately means converging towards writing weak conclusions that could imply any eventuality. Instead, having been successfully brainwashed since birth punters tend to focus on the future by referring to the past. This is our societal programming, it is not surprising why for such conditioning as it is the nature of the world we experience as a time line from birth to death, therefore we are easily conditioned to refer to the past be it economic, market history, political and as most visibly - religious history as per doctrine contained within the religious scripts towards what needs to be done to gain the ultimate bright future, even if that outcome is said to only materialise AFTER one DIES! i.e. in the perfect Afterlife. The inexorable truth where the stock market is concerned has remained constant for the DURATION of what I termed as a STEALTH bull market for at least the first 4 years that on breaking to NEW All time highs has to be recognised a bull market proper. 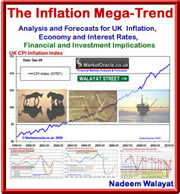 That truth is one of an exponential inflation mega-trend that assets such as stocks and housing are leveraged to as I have covered in over 1000 articles and in four ebook's to date in the inflation mega-trend series (FREE DOWNLOAD NOW) with the latest ebook focused on the housing markets into the end of 2018 due for imminent release (ETA 16th May 2014). While it’s impossible to predict where the market is headed over the next week or month, “there is strong precedent for extended market losses and bear markets following overvalued, overbought, overbullish, rising-yield syndromes,” Hussman says. His very latest article is titled A Textbook Pre-Crash Bubble. Thorough step by step guides of how to buy and sell homes, from locating properties, to making offers to dealing with estate agents and much more. What to do after you move into your new home. Costly home improvements to avoid. and even how to get on with your new neighbours.